Rally Against Backdoor Trade Deals! // Protect People Not Profits! Most of what we eat, drink, wear, drive, and watch is the product of companies that are global in their operations. Their power over our lives, our planet, and our democratic institutions has never been greater, and with Congress’ current attempt to ram through the Trans-Pacific Partnership (TPP) trade deal by way of Fast-Track legislation, corporate-led pursuits of globalization are more imminent than ever before. TPP is like NAFTA on steroids! We cannot allow another job-killing trade deal to pass! 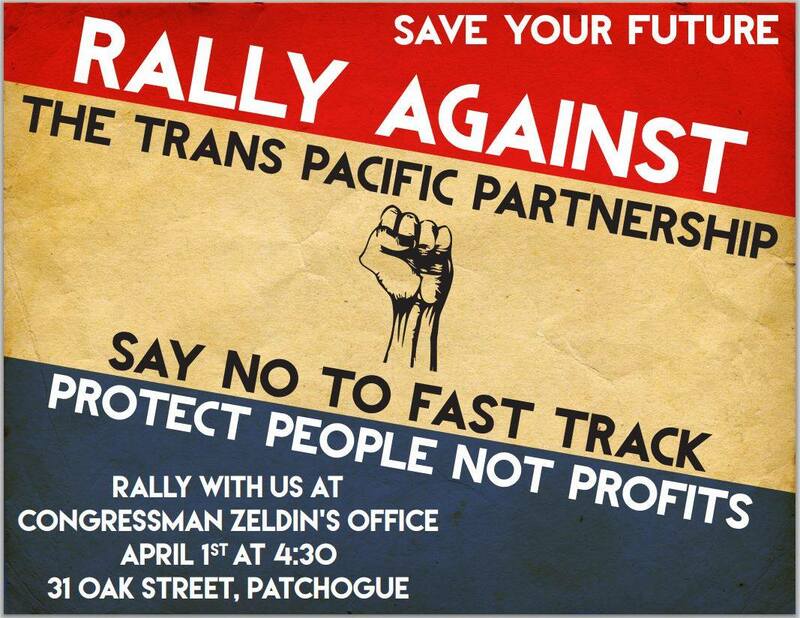 JOIN US on April 1st at 4:30pm at Congressman Zeldin’s district office (31 Oak Street, Patchogue) as we rally against the TPP and Fast-Track and say NO to coporate profits and YES to protecting working people! ← Advocates Urge New York State to Pay Their Share Too!